My coach for the next 12-13 years was my brother, IM Alexander Mikhalevski. During these years I won no less than five Belarus championships for my age category and thus participated in five Junior USSR Championships. In 1991 I moved with my family to Israel. Two months later I shared 2-3rd place in the Israeli Open Championship. Later the same year and also in 1992 I won two Junior Israeli Championships. In the summer of 1991 participated in the Junior World Championship. IM from 1993, GM from 1996. For more complete information, please look at GM Victor Mikhalevski's own site. Hi, I became an International master in 1985, and a Grandmaster in 1990. I have played many times for the French national team, and have been French Teams Champion 8 times with Paris club Clichy. I am currently training the French youth team, and in the past I have been part of Korchnoi's training team and was also a member of Karpov's preparatory team for his World Championship match against Garry Kasparov in New York and Lyon. Strong English/Welsh GM Nigel took control of this site in Jan 2003, as Paul had some health problems and couldn't find the time to write as much as he wanted to. Here we see Nige in typical jovial mood. He hopes to bring his renowned inventiveness to this portion of ChessPublishing.com! 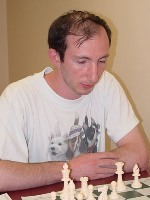 Nigel won the British U21 Championship in 1979 and the British Open quickplay championship in 1988. He obtained the GM title in 1993. He has extensive experience in the Pirc/Modern Defence (including wins over Anand and Larsen with the latter), and has also played these systems with colours reversed, to great effect. 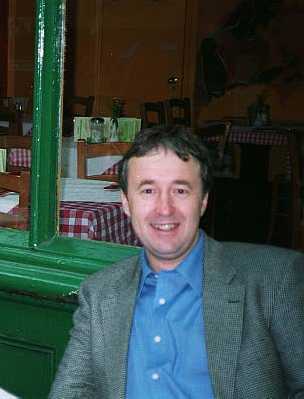 Nigel is well-known for his ability as a trainer, and is currently writing a book on Alekhine's Defence. Nigel writes: "between writing updates I can often be found in the pubs in Southport, and I have a dog called 'Nimzo'"! In games commencing with 1 e4 e5, Paul has defeated many top opponents as White or Black, including Grandmasters Michael Adams, Vladimir Akopian, Miguel Illescas-Cordoba, Daniel King, Pavel Blatny, Antonio Antunes, Helgi Gretarsson, Heikki Westerinen. Some memorable moments & other "snippets"
1) 1986 Dubai Olympiad, where I scored 8/10 and registered my first GM norm with ½ a point to spare. 2) 1987 Scottish Championship, which I won with 8/9, a 2675 rating performance. A consultation game played blindfold in a cable car 11,000 feet up! That was during the 1987 "Snow Cup" team tournament in Aosta, Italy. 1) Winning the 1978/79 World Under-17 Chess Championship in Sas van Gent, Holland. 2) At the Manila Olympiad on Wednesday 17 June 1992 when Chris Morrison, the Scottish team captain, told me that I would be awarded the title of International Grandmaster (Scotland's first). 1) Sunday 2 July 1995, when I married Jenny Zheng Zeng in St John's Catholic Church, Perth, Scotland. 2) Friday 16 October 1998, when at 22:10 my son Michael Zeng Motwani was born. 1) Falling asleep against Colin McNab during a long rook endgame in 1977. I woke up to the sound of the flag falling! 2) Arbiter Harry Golombek falling asleep during my marathon encounter with John Cox at the 1982 Robert Silk tournament. John and I eventually woke him up to report that I'd won! 3) Water dripping onto the board in my game against Harel Elyoseph at the 1980 European Junior Championship. My Israeli opponent had gone to wash his face, but forgot about drying! 1) Nearly falling over the edge of a waterfall during a tournament in Iceland in 1992. 2) Being trapped in a lift for 40 minutes during the 1981 World Junior Championship in Mexico City. 3) Being in a plummeting lift (several times!) during the 1994 Moscow Olympiad. Chess (surprise, surprise! ), films, listening to music, reading.